A major landmark in Invercargill, the Water Tower was built in 1889. Combining utility with adornment, it was built to support the city’s first high-pressure water supply tank. It was designed by consulting engineer William Sharp, and built by Matthew and Hugh Mair. 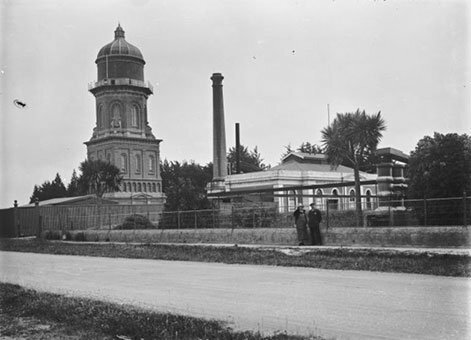 Water tower at Invercargill, circa 1925, Ref; APG-1070-1/2-G, Alexander Turnbull Library, Wellington, New Zealand. 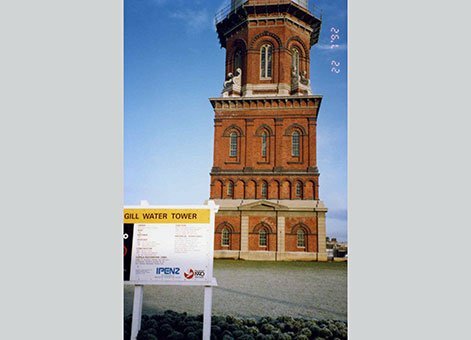 Invercargill’s Water Tower has been described as an architectural treasure and a prime example of Victorian architecture. For the engineering profession the Water Tower demonstrates the ability to provide a utilitarian structure which is aesthetically pleasing. Invercargill is built on almost entirely flat land. The highest point within the Invercargill Borough in the 1880s was designated as reserve land with consequent protection against development. To complement reserve status, the Water Tower was built in brick with a tank covered by a distinctive cupola, unlike many structures of this type which were constructed of concrete or steel with purely function and rather than in mind. Invercargill Water Tower, 1990. IPENZ. Built originally as the primary means of pressurising the city’s water reticulation system, the Water Tower is still a working part of that system but now in a ”back up” role. Pumps now pressurise the reticulation by direct pumping into the mains. However, should the power supply be disrupted and the pumping cease, pressure is provided by the tower. This can occur frequently in winter months as power to the pump station is on interruptible “ripple supply”. 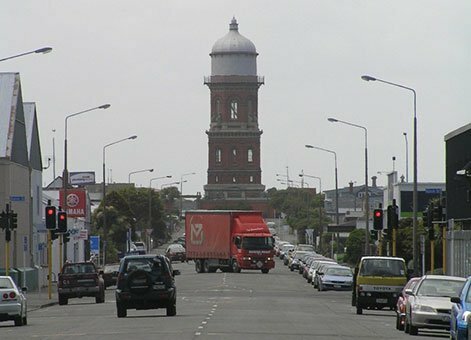 View of Water Tower from the corner of Dee and Leet Streets, Invercargill, 2010. IPENZ. The cupola was removed in 1934 and by the late 20th century some of the brick and plaster work had eroded. To preserve the structure against further deterioration and to commemorate its centenary, restoration work was done in 1989 by the City Council and the main contractor for the project, Fletcher Development. The restoration project received sponsorship from varied sources and attracted much interest from the community. Water Tower: New Zealand Heritage List/Rarangi Korero information. This item of New Zealand’s engineering heritage was recognised as part of the IPENZ “Engineering to 1990” project which the Institution organised to help celebrate the country’s sesquicentenary in 1990. A plaque was unveiled to mark the significance of this water tower as part of the development of the nation. The Water Tower can be viewed from the outside at all times.